We believe in a fair, transparent and easy-to-understand fee structure. This means we roll most fees into our ticket charges so you aren’t hit with an on-going series of miscellaneous fees or hidden charges month after month. At MoneyBlock, we’re introducing a novel concept - keeping more of what you earn. Like you, we don’t like miscellaneous fees or hidden charges. That’s why MoneyBlock’s simple, straightforward pricing gives you the opportunity to keep more of what you earn. Our all-inclusive philosophy means that virtually all the costs we incur as your broker-dealer or custodian are built into our ticket charges. Our low ticket charges cover the miscellaneous costs buried in your current payout like compliance, operations, execution, clearing, system access, development, technology, email, electronic statements and confirms, etc. When you consider that our flat rate structure includes the annoying miscellaneous fees our competitors charge, it’s plain to see the competitive advantage we can offer. As an independent rep or advisor, you’ve earned the right to run your business your way. You decide what products and services best meet your client needs. Our payout structures are customized for each rep and advisor taking into account their unique business model. We look at a number of different variables in order to build a payout structure that will work for you and your clients. In addition, our payouts are typically tiered so that as your business grows so will your payouts. 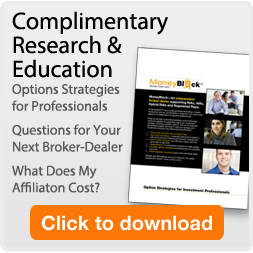 As a MoneyBlock rep or advisor you get the freedom to decide what kind of producer you want to be. And since we don’t offer any proprietary products, you will never be put in a situation where you need to meet a sales quota for a specific product. By combining our highly competitive payout structures, low ticket charges, and the elimination of the miscellaneous fees and charges assessed by many of our competitors, we feel we can provide our reps and advisors with the greatest opportunity for success. State-of-the-art order management tools combined with easy-to-use trade screens allow users to effectively execute their clients’ investment objectives and manage risk. We know how to get the trade done, whether it’s placing a stock, mutual fund, bond, ETF, or even a complex multi-leg option order. Execution quality is continually monitored for speed, liquidity enhancements, and opportunity for price improvement. MoneyBlock.com was designed to empower investment professionals and improve their operating efficiency so they can spend more time with their clients and building their practice, and less time on managing operational and administrative issues. Convenience - Online access to customer accounts 24 hours per day. Review client balances, positions, activity, and other important account information anytime, anywhere. Efficient - All accounts can be opened online to help provide a quick and seamless transition, reduce processing time, and to help facilitate new account acquisition. Simplicity - Easy-to-use layout makes it simple to manage your clients' accounts and organize your workday. Flexibility - Trade equities, options, fixed income, mutual funds and ETFs all in the same account. Clients can move their self-directed accounts to MoneyBlock for added convenience. Innovative - Trading tools to help you find trading and investing opportunities for your clients while helping you assist clients manage their risk. Reliability - Our platform is powered by redundant hardware and software configurations accesing multiple T-1 Internet backbones for maximum reliability. Privacy - Firewall, password, and encryption technology help secure customer data. Customer accounts are cleared and carried by Apex Clearing Corporation, and are covered by the Securities Investor Protection Corporation (SIPC), which is available to meet customer claims of its members up to $500,000 in cash and securities (including a $250,000 cash maximum). In addition, Apex holds Excess SIPC Insurance coverage of $150 million in the aggregate, subject to maximum limits of $37.5 million for any one customer's securities, and $900,000 per customer in respect to cash. * Note: SIPC and Excess SIPC provide coverage against loss of securities and cash, not against market depreciation, fluctuation in market value of your securities or a trading loss. Headquartered in the heart of Chicago’s Financial District, we’re dedicated to servicing Registered Representatives, Investment Advisors, and Independent RIAs, especially those that trade options, and their clients. Our web-based platform was specifically designed to support the unique needs of investment professionals utilizing the same technology that powers our TradingBlock retail model. MoneyBlock’s management team is comprised of a diverse, talented group of industry professionals with a broad range of experience, knowledge and dedication. Our objective is to maintain, innovate, and develop the best possible array of products, services, and technology for independent reps and advisors.